A NIS server must be fully configured with user accounts set up. The ypbind package must be installed on the local system. This is required for NIS services, but is not installed by default. The portmap and ypbind services are started and enabled to start at boot time. This should be configured as part of the ypbind package installation. Select NIS in the User Account Database drop-down menu. Set the information to connect to the NIS server, meaning the NIS domain name and the server host name. If the NIS server is not specified, the authconfig daemon scans for the NIS server. Select the authentication method. 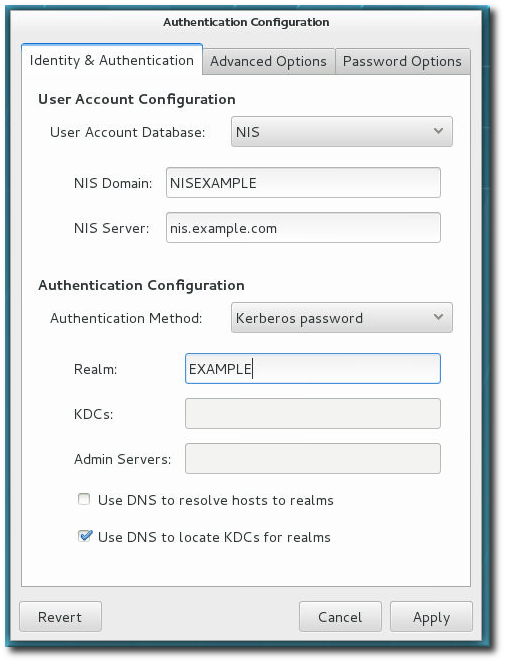 NIS allows simple password authentication or Kerberos authentication. To use a NIS identity store, use the --enablenis. This automatically uses NIS authentication, unless the Kerberos parameters are explicitly set (Section 4.3.2, “Configuring Kerberos Authentication from the Command Line”). The only parameters are to identify the NIS server and NIS domain; if these are not used, then the authconfig service scans the network for NIS servers.